Last month I blogged about how to handle your child saying, "no" and what to do here. But today, I had the lovely experience of doing exactly what I tell parents not to do when trying to avoid a bunch of "No's": taking your child to an overstimulating place like Toys R Us or Target. I guess I thought my child was still young enough to go down the toy aisles at Target without her wanting everything in sight! Remember those days when your child was young enough and you could take her anywhere? Target was having a 75% off toys sale and I thought, "ooooh, let's go see what they have so we can stock up for Christmas gifts." Big mistake. Now that my child is also signing, "more" which really is meaning "I want", she wanted everything in sight. I guess I was wrong when I thought she would be able to handle her self-control when seeing a TON of toys from top to bottom. Can you blame the poor thing? I definitely got my practice in with the limit setting today. I got a lot of practice saying, "I know you really want that ball, but it has to stay in the cage today." "That toy is not for touching," Or, "That really looks like a fun toy, but today we are just going to look at the toys." She was able to follow my lead thankfully and listened to my limit setting. Yay, it worked! But she still looked at me like I was crazy. For a 14 month old- being told a toy is not for touching, and redirecting her is not exactly easy for the "I want, I want" aged child. I also came prepared though and gave her one of her own toys from my diaper bag and some snacks. Whew! But, I learned my lesson. To only shop for toys when she is NOT with me. When she is past this stage and older, then I can take her back (hopefully). But at this young age when they are not able to exhibit self-control as much and they don't understand why they are not allowed to have it ALL. 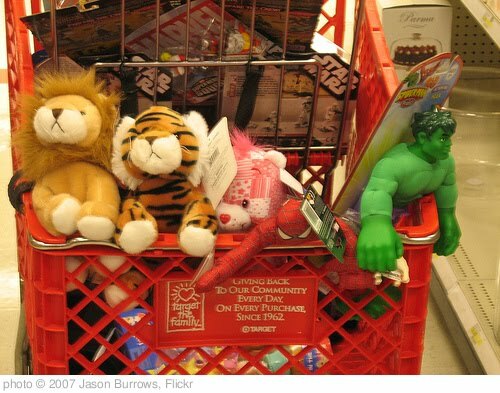 It is really best to steer clear of all the enticing fun toys and stores! I know, I should have known better. But I guess this is what my blog is all about. Learning as I go and having fun with all of the parenting mistakes a counselor makes! Love it! So true but sometimes I think you have to let your child see reality and showing them that not everything is their's to have. It's definitely a balance you have to give them.